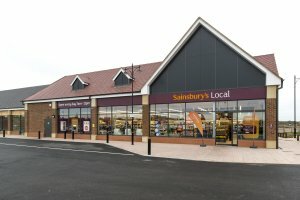 Wilson Bowden Developments, in partnership with David Wilson Homes developed a new local centre anchored by Sainsbury's Local at Great Denham, Bedford which was completed in Spring 2016. The 7,500 ft² scheme is located within a 1,500 housing development by David Wilson Homes. Other occupiers include Barnardo's, Cambridge Grill and a local independent Hair Salon. The investment was sold to The Ironmongers' Trust Company in Spring 2016 following practical completion. "This is a great addition to the local community's shopping facilities. Sainsbury's colleagues and I have been looking forward to welcoming our new customers in store." "Along with our DWH colleagues we are thrilled to open a new Local Centre in Great Denham, as we've worked closely with both the occupiers and the local community to help bring this about, and we believe it will add to the vibrancy of the developing area."